The Scottish wildcat faces extinction, animal experts have warned. The Mammals Trust UK claims the species is "on the brink of extinction" due to it interbreeding with domestic cats. But mammalogists behind the research say a revamp of current measures to protect and conserve the population could save them from dying out. They blame the wildcat decline on the intrusion of domestic cat genes into the population which has left only a few hundred pure animals in the wild. The research was carried out for the Mammals Trust by Oxford University's Wildlife Conservation Research Unit (WildCRU). It found Scottish wildcats are increasingly rare and roam mostly across the Grampians and northern Highlands. The study described how inbreeding with their domestic cat cousins had forced pure wildcats into decline, pushing them as an individual species towards extinction. The pure variety are bigger than the average domestic cat and despite having Tabby-like colourings can be also be distinguished by their vertical black stripes and the black rings around their tails. Dr Mike Daniels, who was part of the WildCRU research team, said: "The difference is subtle and there's much less difference between a domestic cat and a wildcat than say a wolf and a dog. "That being said, if you were to throw a domestic moggy out onto the Grampians it wouldn't really survive very well. "So there is something out there which makes a cat adapt to its environment and a wildcat a wildcat and that's what makes it special." He said laws protecting the animals needed to change to help them survive and suggested that the areas where they live should be protected rather than the animals themselves. He said: "The law at the moment focuses very much on the description of a wildcat and that might work for some cats." The definition of a wildcat depended on where it lived, rather than what it looked like and the law should take account of that. "In these areas we could try and restrict domestic cat genes entering into the population," he went on. "At the moment there are no restrictions on people owning domestic cats or having them neutered and basically that isn't helping. 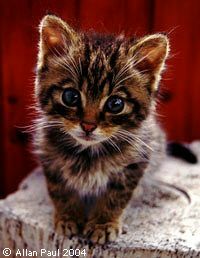 "If we could restrict domestic cats genes then we could back a purer wildcat." The report was primarily put together by WildCRU's Professor David Macdonald and Dr Fran Tattersall, two of the UK's most eminent mammalogists. They were asked to investigate the changing fortunes of other mammals, not solely the wildcat, and produced more bad news for another species north of the border. They found that the red squirrel in southern Scotland also seems doomed to extinction due to an invasion of grey squirrels and outbreaks of parapox virus. Professor Macdonald said: "This has been an extraordinary year for mammal conservation, with advances for creatures as varied as water voles, otters and bats. "However, there are also still huge problems ahead, such as the fate of the red squirrel and Scottish wildcat." Mammals Trust UK chief executive Dr Valerie Keeble added: "Professor Macdonald and Dr Tattersall's report provides us with an excellent insight into the fate of our native mammals as it currently stands. "The report will be a very useful tool in the strategic planning of future conservation work."